Here is the first set (and what I wrote about Joel) of that glorious afternoon. And now, as the night follows the day or some equivalent, is the second. Joel at his poetic unpredictable best. Each piece feels like a short story, and the whimsical titles add to the effect. Having heard several performances of Joel’s INDUSTRIAL ARTS, excerpts and improvisations on sections of this piece, which he has been known to perform for eight hours, I asked him to write something about it, because the piece so stands out — in its incantatory splendor — in what I think of as his oeuvre. Joel writes: I’ve been improvising on it since l974, my first year in New York. When I’m feeling emotionally generous, I give my wife Mary co-composer credit: the music has its genesis in our weekly Saturday mornings at Washington Square Church. I’d improvise at the piano while watching her dance; she feels time in a deeper way than any dancer I’ve ever seen. This would go on for several hours (we were quite young). Then we’d wax ‘n’ buff the floor. The music grew, its interlocking rhythms calling out weird overtones I would learn to embrace if never truly to corral. In its entirety, INDUSTRIAL ARTS occupies 8 hours. I’ve only played it straight-through once: at The Kitchen in l977. I’ve always striven to play a precis of the tune on my solo gigs, borrowing ideas from the 8 one-hour sections. At least 11 times, over the years, I’ve either been warned, fired, or not asked back…all on account of this one, highly-repetitive tune. The most humorous instance of this took place in 1980 at a Bowery art bar called Sebossek’s. I was only five minutes into INDUSTRIAL ARTS when the Israeli cook burst out of the kitchen with blood in her eyes and a sizzling pan in her hand. What she wanted to do was to show me that she had burned herself, thanks to my music. But, of course, what I saw was a furious woman holding a frying pan. For my sins, I admit that I cowered under the piano. …Over the last five years, all that has changed—who can tell me why? Have listeners become inured to repetitive music, if presented in different forms from mine? Short attention spans promoting selective deafness? In any case, a 10- or 15-minute version of INDUSTRIAL ARTS has become part of my standard repertoire; and I seem to be getting away with it. And longer “concert” versions are sometimes called for. Who knew? As I write these words, Joel has a steady Saturday afternoon gig (12:30 to 3:30) at Cafe Loup (135 West 13th Street at Sixth Avenue, Greenwich Village, New York City) and June is an extraordinarily rich month for Forrester-sightings, so check them out http://joelforrester.com/calendar/. Posted in "Thanks A Million", Bliss!, Ideal Places, Irreplaceable, It's All True, Jazz Titans, Pay Attention!, Swing You Cats!, That Was Fun!, The Heroes Among Us, The Real Thing, The Things We Love, Wow! The musical experiences Joel offered that afternoon were, to me, deeper than simple music. It felt as if he was a repertory company: each performance seemed its own small world — balancing on its own axis — and then gave way to the next. A gritty blues was followed by a romantic lament, then a rollicking saunter through an unknown landscape, then a dance from a traveling carnival . . . as you will hear for yourself. Joel is always balancing strong rhythms and subtle melodies, creating his own shapes and changing those created by others. 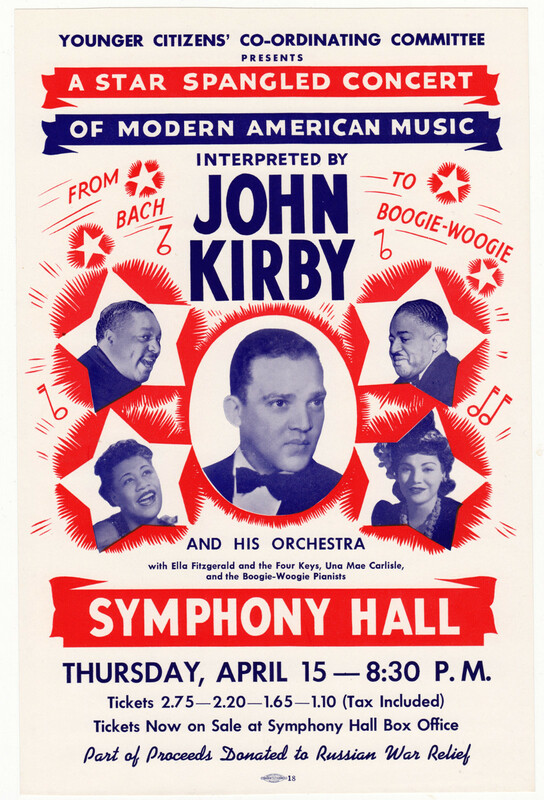 The range of his inspirations is amazingly broad: in the course of the afternoon’s recital for an admiring audience, he evoked and improvised on the blues and boogie woogie, Billie Holiday, George Gershwin, Duke Ellington, Thelonious Monk, Cole Porter, Meade Lux Lewis, James Joyce, hymns, the Beatles, and Sam Cooke. There’s more to come from this afternoon at Cafe Loup, and more from Joel in his many guises, all restorative. He has many and various gigs: visit here. One of the most pleasures of JAZZ LIVES is that some people find it to offer information or to ask for help in solving mysteries. A few weeks ago I received a most pleasant email from a woman in the Middle West. Margaret had found JAZZ LIVES and hoped I could answer a few questions. I’m writing to you because I think you may like jazz as much as my dad did. 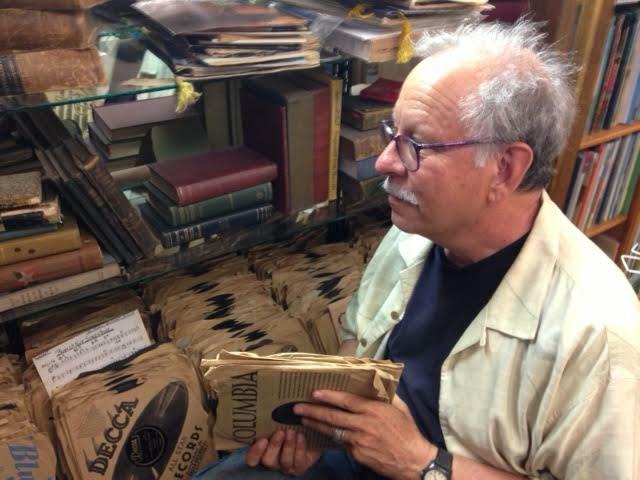 He loved jazz, had a huge record collection (now gone, sadly) and large library of jazz related books. 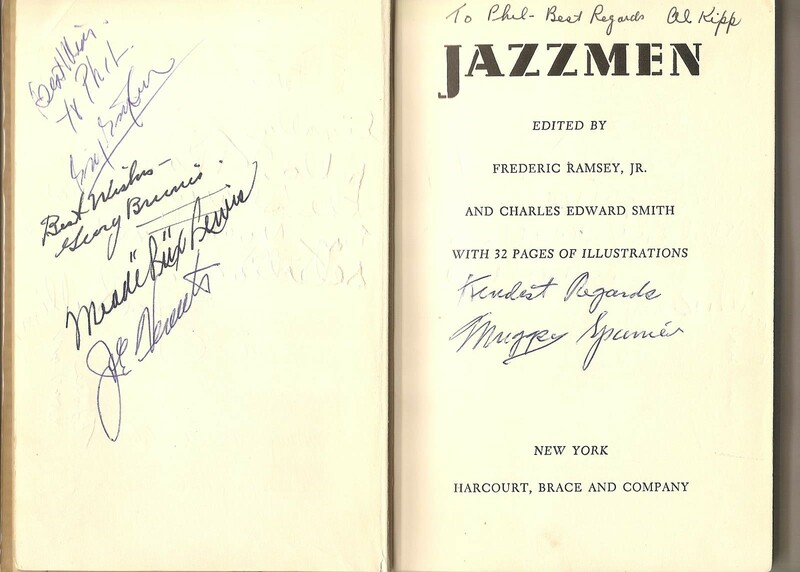 One of them, Jazzmen, by Frederic Ramsey, Jr. and Charles Edward Smith, he took with him when he went to hear his favorite players, and got autographs. 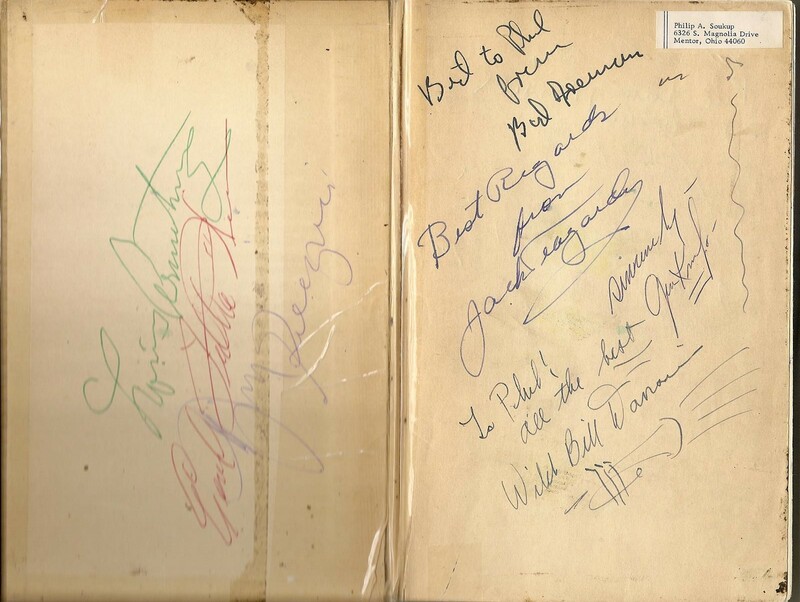 It’s a very special book, with autographs from: Louis Armstrong, Jack Teagarden, Gene Krupa, Wild Bill Davison, Earl “Fatha” Hines, Marshall Brown, Pee Wee Russell, Herman Autrey (trumpet), George Wettling, Ruby Braff, Joe Sullivan (they were friends; Joe came to our house and he and dad exchanged Christmas cards) Jimmy MacPartland, Henry “Red” Allen, George Brunis, Meade “Lux” Lewis, Joe Venuti, Al Kipp, Muggsy Spanier, Eddie Condon, Bud Freeman. There’s also a Jim? P…? or Dueguis?, and possibly Gene Gifford. Also interesting, under Pew Wee Russell’s name is “e e mudder”. Please can you help me fill in the blanks? My time in the English Department was helpful, and I told Margaret that I thought “e e mudder” was Pee Wee’s take on the poet e e cummings, someone he might have met or read or certainly heard of in all those years playing south of Fourteenth Street in Greenwich Village. But although I’ve done a good amount of handwriting-deciphering for book projects (as well as trying to figure out what my students might be writing in their untrained calligraphy) I couldn’t solve the mysteries. Perhaps JAZZ LIVES’ readers can? 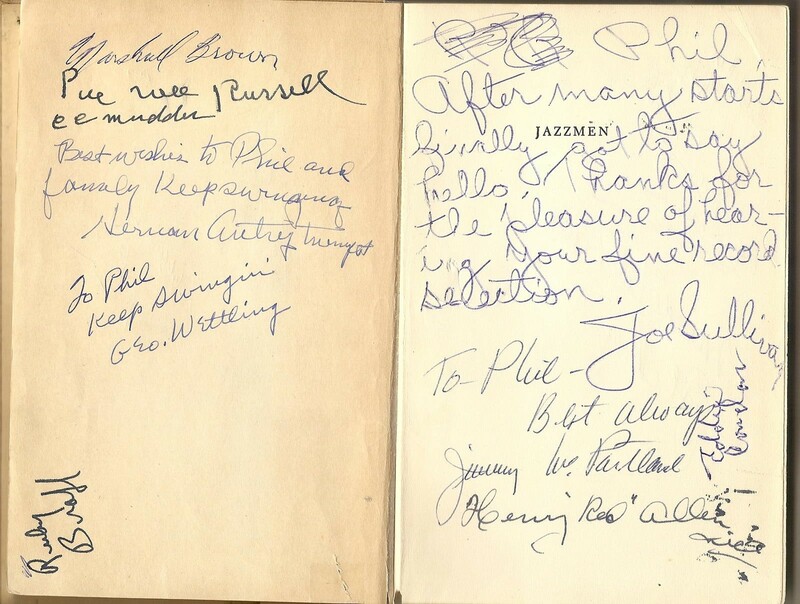 Here are several pages from the writer’s father’s copy of JAZZMEN. Left, Marshall Brown, Pee Wee Russell and his alter ego, e e mudder, Herman Autrey, George Wettling, Ruby Braff. Right, Joe Sullivan, Jimmy McPartland, Eddie Condon, Henry “Red” Allen. Left, Louis Armstrong in green, Earl Fatha Hines in red, and . . . Jim Deeguis? 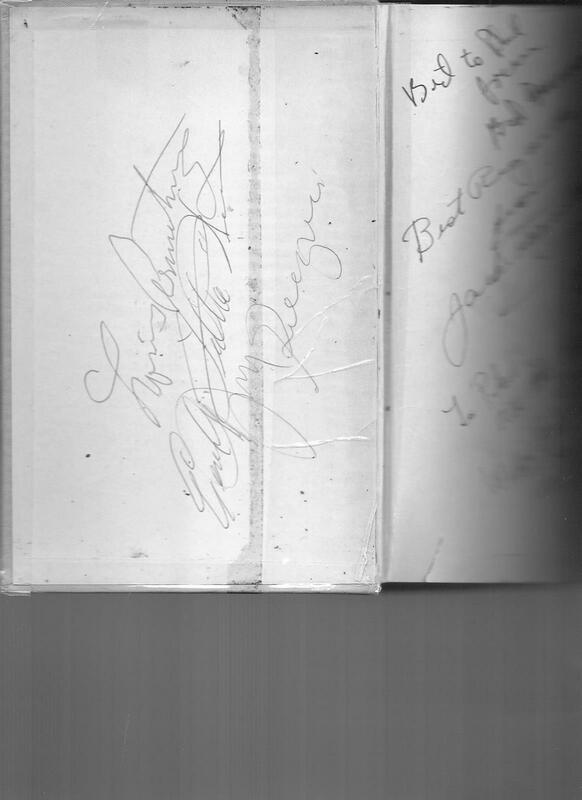 News flash: my friend Kris Bauwens says the mysterious signature isn’t so mysterious: it’s Dizzy Gillespie. 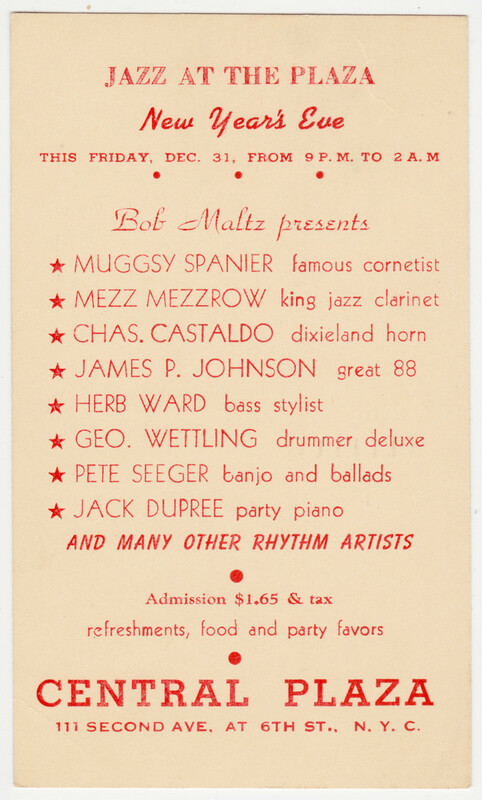 Right, Bud Freeman, Jack Teagarden, Gene Krupa, Wild Bill Davison. 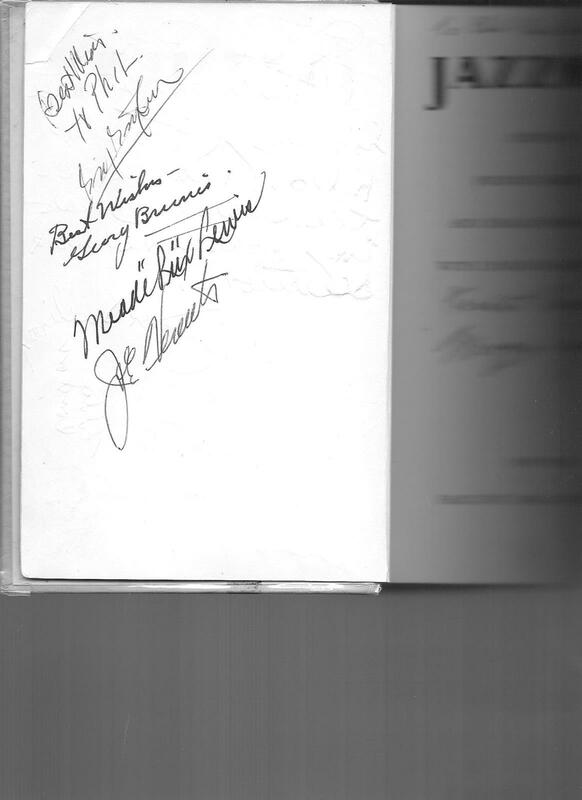 Left, possibly Zutty Singleton, certainly Georg Brunis, Meade Lux Lewis, Joe Venuti. Right, Al Kipp, Muggsy Spanier. Any suggestions about “Jim Deeguis”? and perhaps-Zutty Singleton? And some biography on Al Kipp? Thanks to Margaret for searching me out, and thanks for the devoted Phil, who had such friends . . .
Posted in "Thanks A Million", Bliss!, Generosities, Irreplaceable, It's A Mystery, It's All True, Jazz Titans, Swing You Cats!, That Was Fun!, The Heroes Among Us, The Real Thing, The Things We Love, Wow! The nymphs and shepherds of pastoral verse, playing their pipes, weaving garlands of flowers, are hard to find. 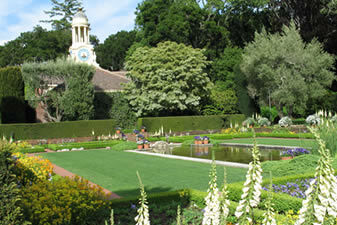 But there’s one place where a beautiful setting and uplifting jazz improvisations come together — the remarkable gardens and estate at Filoli in Woodside, California. On July 29, 2012, these four players showed everyone how it’s done — Rossano and Stephanie, striding or musing, at the pianos, Nicki singing and playing the string bass; Hal swinging out at the drums. And, yes, shepherds and nymphs of the twenty-first century, there is a second set. But for now, revel in this one.